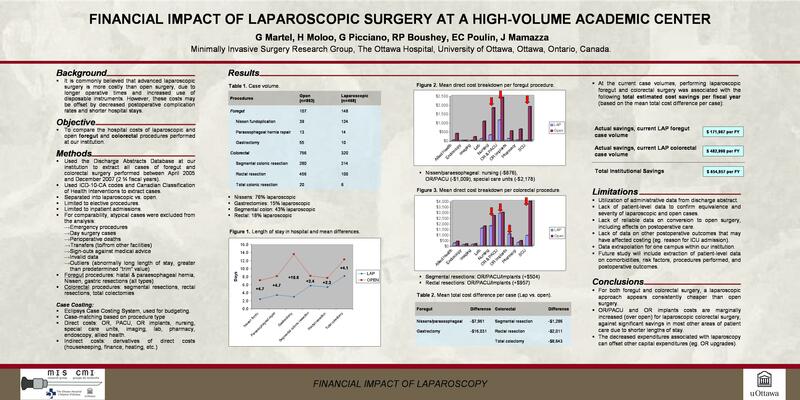 INTRODUCTION: The objective of this study was to compare the hospital costs of laparoscopic and open foregut and colorectal surgery at our institution. METHODS: Consecutive patients undergoing elective foregut surgery (fundoplication, paraesophageal hernia repair), segmental colectomy, and rectal resection between 2005 and 2007 were identified from a hospital administrative database. The Eclipsys Case Costing System, used for hospital budgeting, produced data for each patient. Descriptive comparisons of matching laparoscopic and open operations were generated. To standardize comparisons, emergencies, day surgeries, perioperative deaths, transfers to and from our institution, and outliers were excluded. RESULTS: In total, 73% of foregut procedures (138/190), and 30% of colorectal resections (314/1,050) were performed laparoscopically. The mean length of stay in hospital was 4.9 days shorter for laparoscopic foregut procedures (2.6 vs. 7.4 days), and 2.2 days shorter for laparoscopic colorectal resections (5.7 vs. 7.8 days). Laparoscopic foregut surgery was associated with a mean $7,961 total saving per case, over open surgery. Laparoscopic foregut procedures were associated with mean savings per case in nursing ($876), operating and recovery rooms ($1,009), and special care unit ($2,178) costs. Laparoscopic segmental colectomies were associated with a mean $1,287 total saving per case, while laparoscopic rectal resections yielded a mean $2,009 total saving per case. Although mean operating and recovery room costs per case were marginally greater for laparoscopic colorectal surgery (segmental $504, rectal $957), significant savings were achieved with nursing ($870) and special care unit ($1,818) expenditures. At current case volumes, laparoscopic procedures have yielded over five hundred thousand dollars per fiscal year in cost savings at our institution. CONCLUSIONS: For both foregut and colorectal procedures, laparoscopy appears to be consistently cheaper than open surgery. While operating room costs are marginally higher with laparoscopic colorectal surgery, significant savings are achieved in other areas of patient care due to shorter hospital stays.